Ehime was home to the thirteenth G1 Climax 27 show, featuring action from the A block. In the main event, Hiroshi Tanahashi took on Togi Makabe. 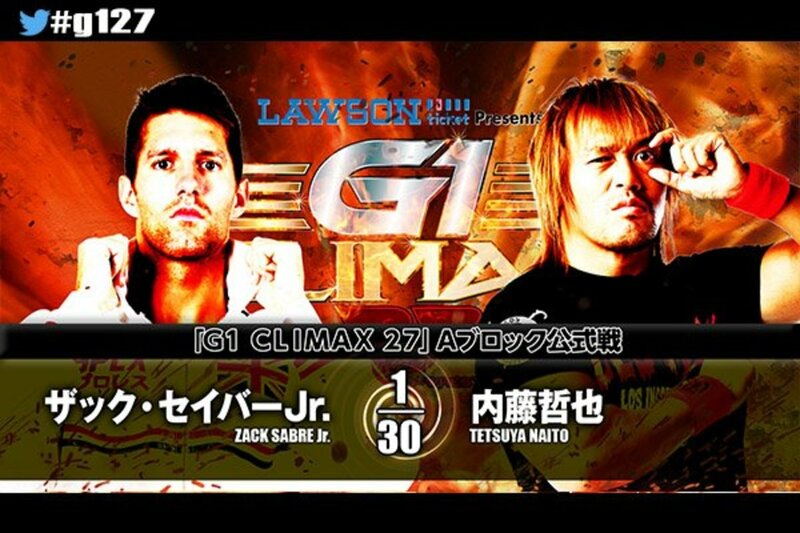 Before that, Tetsuya Naito faced off against Zack Sabre Jr. in their first-ever singles battle in the semi-main event. - Tama Tonga & Yujiro Takahashi defeated Katsuya Kitamura & Tomoyuki Oka when Takahashi pinned Kitamura with the Pimp Juice DDT. - Minoru Suzuki, Taichi & El Desperado defeated Michael Elgin, Tiger Mask IV & Hirai Kawato when Desperado pinned Kawato with the Angel’s Wings. - Satoshi Kojima & Hiroyoshi Tenzan defeated SANADA & BUSHI after Kojima hit BUSHI with a lariat. - Juice Robinson & David Finlay defeated Kenny Omega & Chase Owens when Robinson pinned Owens with the Pulp Friction. - Kazuchika Okada & Toru Yano defeated EVIL & Hiromu Takahashi when Yano rolled up Takahashi for a flash pin. Nagata once again continued to prove he’s one of the best workers around at his age. This was great, with the crowd totally wanting to see Nagata pick up his first win in the tournament. Ibushi’s resilience to all the damage he absorbed during the match was something to behold as well. They mat wrestled early, with Nagata honing in on one of Ibushi’s arms. Ibushi broke free and began to fight back, including landing the standing hurricanrana. Nagata hit an exploder as he assaulted Ibushi on the ground. Nagata continued to build momentum, hitting a brainbuster and a back suplex, but he found Ibushi to be very resilient. He went for another, but Ibushi floated over a German suplex attempt and stuck a Pele kick. He tried to finish with a press powerbomb, but Nagata kicked out. Ibushi followed with his new finisher, a double wrist knee strike called the Kamigoye, for the win. Fale dominated a lot of the match due to his sheer strength. Every time Ishii tried to mount a comeback, Fale would shut it down pretty quickly. Ishii finally got somewhere when he grabbed Fale and laid him out with a brainbuster. Ishii hit the ropes twice -- landing a big lariat -- and went for the sliding D, but Fale grabbed him by the throat. Ishii took him down with an armbar, but Fale escaped. Ishii escaped the Bad Luck Fall and chopped him back down and went back to an armbar. Fale came back to life with a spear, then hit Ishii with the Bad Luck Fall for the win in a very good match. This was a back-and-forth match early, with neither really gaining any advantage until YOSHI-HASHI went for a jackknife cover, then went for a butterfly lock. He went for the sleeper, but Goto transitioned into one of his own. YOSHI-HASHI avoided Goto’s GTR twice and leveled him with a superkick. He tried to go for Karma, but Goto laid him out and hit two GTRs for the win. This was good while it lasted. Tetsuya Naito defeated Zack Sabre Jr.
Sabre took down Naito and focused on the neck area, using his feet to twist it around. Naito fought back, but Sabre continued to find ways to work on Naito’s body, latching onto a body part every time Naito tried to gain some momentum. Naito finally was able to hit the satellite DDT, giving him some momentum. He hit a koppo kick and went for the Destino, but Sabre escaped and went for a few clever pinfall attempts, rolling up Naito in a number of ways. Naito escaped a penalty kick attempt, hit an enzuigiri and a shoulder breaker, then hit the Destino for the win. This was really good, telling a good story. This was good, but there have been many good matches in this tournament. Unfortunately, this is going to be one of those matches that gets lost in the shuffle. Makabe took out Tanahashi early, clotheslining him on the outside. Tanahashi fought back, landing the senton, but Makabe responded by taking him to the corner and mounting him with punches. He followed with the kneeling powerbomb and went for the King Kong knee drop, but Tanahashi avoided it. Tanahashi responded with the twist and shout neckbreaker as he soon went for the High Fly Flow, but he found no one there upon impact. Makabe drilled Tanahashi with German suplexes and took him to the top rope for the Spider suplex. Tanahashi instead reversed it and landed a German suplex pin for a near fall. Tanahashi went for two High Fly Flows, got them both, and scored the win. Tanahashi played air guitar to close out the show.